Michael Capuano and Ayanna Pressley. 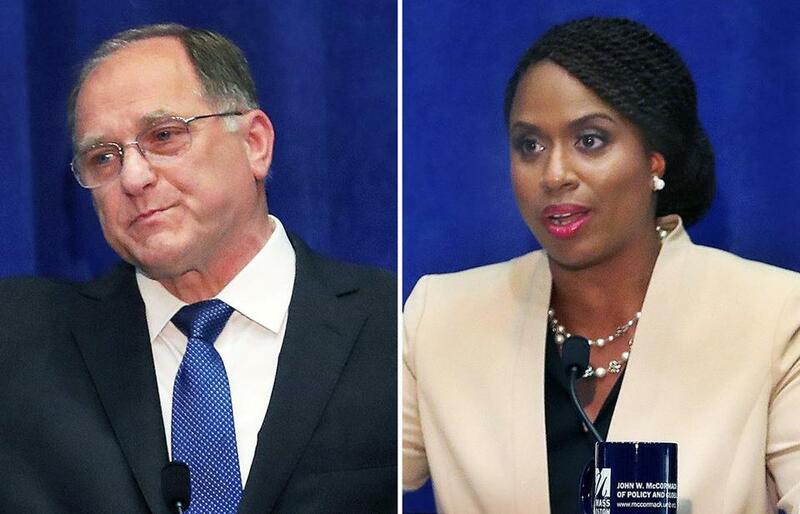 Representative Michael E. Capuano and his primary challenger, City Councilor Ayanna Pressley, say they agree on most policy issues. But one industry group clearly sees a massive difference between the two Democrats, enough to plunk down nearly $300,000 on online ads, direct mail, and polling to help Capuano defeat Pressley in the primary on Sept. 4. The National Association of Realtors, a Chicago-based group which calls itself America’s largest trade association, representing 1.3 million realtors nationwide, has spent $282,945 from its congressional political action committee to boost Capuano’s reelection campaign, according to the Federal Election Commission. The spending includes $122,000 on online ads, $94,000 on direct mail, and $33,000 on polling, federal records show. Capuano, a 10-term congressman, sits on the House Financial Services Committee, which oversees the housing and insurance industries, and represents one of the most lucrative real estate markets in the country in Boston, Cambridge, and Somerville. The group has created a website, realtorsforcapuano.com, which calls Capuano “a leader on the issues that matter most to Mass. Realtors,” and cites a number of policies he supported that were favored by the trade association. “Mike understands the importance of protecting consumers while ensuring that new regulations do not needlessly delay transactions,” the website says. The website also says Capuano supported federal housing rules that allow for “more efficient approvals” of condo buildings; legislation to “correct increases” in flood insurance premiums; and legislation to allow home buyers with federally backed student loans to refinance their mortgages and take advantage of lower interest rates. The group’s spending on the Seventh Congressional District race adds to Capuano’s already formidable financial advantage over Pressley, which has allowed the congressman to advertise heavily on broadcast and cable television, while Pressley has been limited to a small ad buy on two Spanish-language television networks. The latest federal records, released Wednesday show that, for the the six-week period between July 1 and Aug. 15, Capuano pulled in $215,000, spent $927,000, and still had $751,000 cash on hand. A large portion of Capuano’s spending — more than $400,000 — went to television ads, the records show. During the same period, Pressley raised $167,000, spent $382,000, and had $131,00 cash on hand.